As new parents know, there is nothing quite as excit¬ing as listening to a child speak his or her first words. In a fascinating and informative new book, children's language development specialists Margaret Macla¬gan and Anne Buckley explain the subtle, extraordi¬nary process by which children learn to talk and the very important role that parents can play. 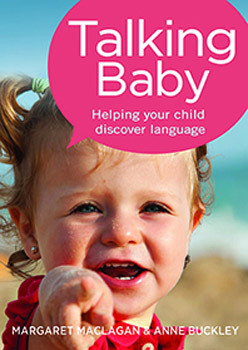 Talking Baby: Helping your child discover language, has won pre-publication praise from linguists and specialists in early childhood literacy. -Talking Baby is required reading for every parent, grandparent, educator, student or anyone work-ing with children', says Elisabeth Duursma a se¬nior lecturer in early childhood literacy at the University of Wollongong. Babies laugh at three to four months. They use it to interact with their parents. It is thought laughter evolved from the panting of apes. Hearing a -lot of language' is positively related to children producing a lot of language. Eighteen-month-old toddlers learn an average of two to five new words a day. Babies cry with an accent within the first week of their life, reflecting the pitch and tonal quali¬ties of their parents. Maclagan and Buckley provide a comprehensive understanding of speech development alongside fascinating scientific facts, as well as providing nu¬merous practical suggestions and real-life examples of how parents can best help their children to learn to talk. The authors also supply ideas ideas for -talk¬ing' topics, as well as ways to use the everyday things in life to encourage children's comprehension and speech. Margaret Maclagan has been a lecturer in child language development and language analysis for more than three decades. She taught speech-language therapists at the University of Canterbury, is an author and editor of academic books, and now writes for a general audience. She is a mother and grandmother. Anne Buckley is a former speech– language therapist. She has worked in medical publishing for more than a decade as a medical writer and editor, and has been involved in writing for the web and in print for health professionals and consumers. Anne has a teenage son. Question: What inspired you to write Talking Baby? Margaret Maclagan and Anne Buckley: It's really easy to miss out on the wonder of language development because life with young children is so busy. We found that our understanding of how speech and language develops added to our enjoyment of our own children and other children in our lives. Talking Baby was written to provide chatty information and enjoyable ideas for parents and others. Question: Can you talk about the research that went into Talking Baby? Margaret Maclagan and Anne Buckley: Talking Baby draws largely on our collective experience teaching students about speech and language development, observing normal children's language and working with children with speech and language difficulties. Question: How important is it to talk to a baby, from birth? Margaret Maclagan and Anne Buckley: It's essential to talk to a baby right from birth. Babies recognize their mother's voice from birth and like to listen to them speaking. They're like a sponge and soak up all that language even though they won't say any words for about a year. Question: Is -baby talk' okay? And, when should -baby talk' be stopped? Margaret Maclagan and Anne Buckley: It's really important to talk to babies, and -baby talk' is a good way to do this. It's part of simplifying your language to help them understand. Once they start to talk themselves, you'll usually find you no longer need to use -baby talk' to them. Question: How early should we start reading to our children? Margaret Maclagan and Anne Buckley: It's good to start reading to your child as soon as you're comfortable. At first your baby won't understand the words but will enjoy listening to your voice. From about 6 months, they'll start to understand. Now it's usually better to talk about the pictures than read the story. Soon you can use the pictures to tell the story but don't expect your child to want to hear the whole story till they're about two to three years old. It's really good to have books in your baby's cot too so they can look at the pictures by themselves. Talking Baby has a lot of tips about reading to your young child. Question: Why do children often repeat the same word, when learning to talk (eg. Car car)? Margaret Maclagan and Anne Buckley: Children copy the adults round them. When we talk to babies we use a lot of words that are doubled up like choo choo or bye-bye or night-night. So babies often copy this pattern and saybobo for bottle or dada for car. Babies find it's easier to say the beginning of words than the end of words.